Available on GSA Program Pricing - Call or Request Quote! The perfect compliment to your GSA Approved container is an NSA/CSS 02-01 approved paper shredder! With the highest security level for shredding documents and an automatic oiler, you can get the job done in no time flat! The Dahle CleanTEC® Shredders are the World's only shredders with a fine dust filtration system. The DAHLE CleanTEC® filter permanently traps up to 98% of the fine dust, and provides a cleaner, healthier work environment. 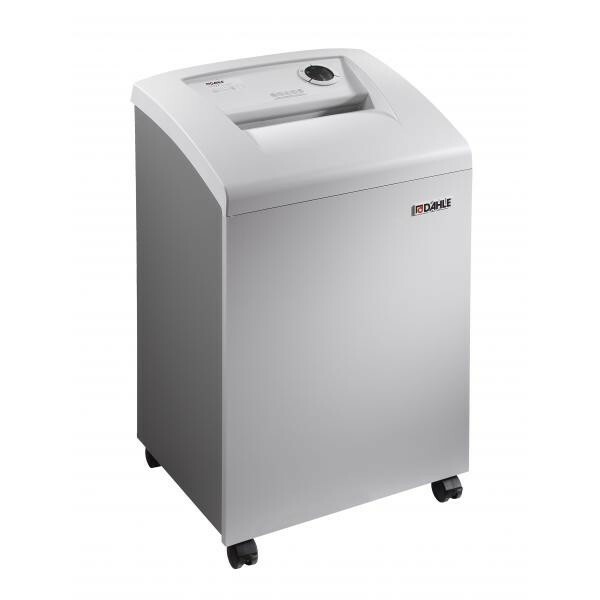 The DAHLE CleanTEC® 41334 Small Office Shredder features the most advanced safety features in the industry. Equipped with the revolution­ary Safe Technology Package, the shredder will immediately stop in an emergency when shouting “Stop!” or by tapping the top cover of the machine. The 10 1/4" feed opening is reinforced with steel and only large enough to accept paper. As an added safeguard, this opening contains electronic sensors that will turn the shredder off, should your fingers get too close. Easy to use command dial controls let you know when sheet capacity, when to replace the filter, and even when to change the shred bag. The DAHLE CleanTEC® 41334 operates us­ing the intuitive SmartPower Energy Man­agement System. This multi-stage system re­duces power consumption after ten minutes of sitting idle (sleep mode), and completely powers down after 30 minutes of inactivity. Dahle SmartPower will appeal to those in­terested in conserving energy as well as re­ducing electrical costs. This German engineered, fine-tuned machine is equipped with the Dahle EvenFlow Lubricator – an automatic oiler the keeps the cutting mechanism in top conditions and ensures peak performance.